Certificate as awarded to Cafe Salamera following this nomination. Okay, so the idea we're encouraging here is that people link to as many LTHForum threads as possible about a restaurant when nominating it. Sheer numbers don't guarantee the award, but they are certainly an indicator of community interest and a starting point for us as we judge which restaurants have a breadth of community support. 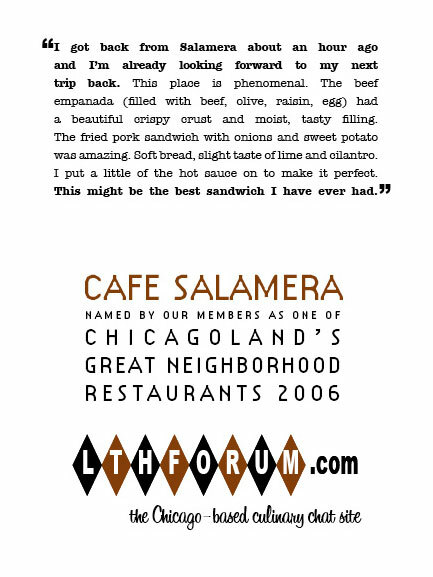 Having said that... there's only one thread about Cafe Salamera. * Norka told us she was using leaner pork loin because gringos wouldn't eat authentically fatty pork. We demonstrated that this was untrue, and she's back to the good stuff. Last edited by Mike G on August 19th, 2007, 11:28 pm, edited 2 times in total. I'll second the nomination for Cafe Salamera. We were just there on Saturday and tried a couple of the sandwiches we hadn't yet tried. Excellent as usual. I'm very surprised that there hasn't been more discussion of this nomination, considering what a sentimental favorite this place is. The food is great as is the hospitality. I hope Cafe Salamera gets presented a GNR, and I hope to be there to see the look on Norka's face when she receives it. Nice place, nice people, pleasant sammies. What can be bad? My biggest fear is that Cafe Salamera won't be around to receive the award. I drive by regularly and a "for sale" sign has reappeared in the window. It has additional writing on it so I'm hopeful it's for someone's car and not for the restaurant. Last night, there was a white piece of paper with some printing on it. Hard to distinguish what it said as I don't read small things well at 25 mph. Mr. X and I will continue to eat our way through the menu as long as we can. Someday soon, I hope to run into other LTHers there to share in the enjoyment! A friend of mine and myself had lunch there yesterday. We talked to the owner and she indicated that the place is forsale unfortunately. She is not able to make enough to even pay her workers she says. She wants to sell it (at a loss she thinks). Her parents, the cooks apprarently, are leaving this weekend back to Peru.It is really sad to see this happen.
. . . and very sad. waderoberts wrote: . . . and very sad. I hope nobody will let this stop them from voting for Salamera as a GNR. see no difference from normal. just that, a Christmas break. a sudden, things could still change? voting for a GNR for it? c8w wrote: The restaurant is open until December 21. Then, it will close December 22nd for 10 days, for Christmas break. It will reopen in early January - the break is just that, a Christmas break. Thanks for the info, c8w...I will definitely need to visit again before the 22nd. And I agree with you, these circumstances don't change the fact that Salamera is still serving up wonderful food and is quite deserving of the GNR designation. I wholeheartedly and enthusiastically support this well-deserved nomination, too. I certainly didn't mean to dissuade affirmations, but was only expressing my sorrow that such a great place as Salamera is finding such a tough row to hoe. P.S. To the moderators: I support the way the GNR awards are currently assessed, at least at this time, and bless you: you have some wonderful nominees so far this round. I've been to Salamera only once but, living on the southside, it's a long ways away. I wish it were nearer and very much hope they can find a way not only to survive but to thrive. The one meal I had there was delicious and the service couldn't have been more friendly and helpful and generous. Inspired by the praise on this board, three of us had dinner at Cafe Salamera. The ceviche was outstanding (all three of us loved it, some of the best we've had in the city), "jumping beef" was good (one dining companion liked it more than I, one less -- not a fancy dish, but flavorful beef and some decent fries), and the fried pork sandwich was just too unctuous for all of us. We were warned "the pork is very fatty," and have enjoyed pork belly before. But it was just too much. Noticing we ate around a fair amount of the pork belly bits, the proprietress mentioned she switched to pork shoulder but some "food critics" told her she should switch back to the pork belly. Having read about this request on the other Salamera thread and knowing who the "food critics" probably were, I got a kick out of this. But truth be told, all three of us would have much rather had this sandwich with pork shoulder than with the pork belly (seems like pork shoulder would have plenty of flavor and fat to carry the sandwich -- aren't pulled pork sandwiches often made from shoulder cuts?). I don't think I would order the fried pork sandwich again in its current form, but as they say: different pork fat amounts for different folks. Nonetheless, I would go back anyday for the ceviche and there were plenty of other dishes I would love to try. I hope their business picks up and the place can stay under current ownership and chef. Thanks to all on the board for reporting back about this fine neighborhood restaurant and getting the word out. What was suggested by Gary, myself and perhaps others was to offer two variants of the sandwich: one pork belly for natives (and who want to try it as recognized by Peruvians) and pork shoulder for Americans. Each version of the sandwich has it's groupies! As much as I agree with you I want it to remain, I also have the feeling to enjoy while it is still around. The pork loin was too lean and dry. I agree the pork belly is fatty as hell, in fact I usually trim down the pieces at table and put them back in my sandwich, not the daintiest lunch I ever had, but damn tasty. May have to go there today, in fact. Just to clarify, Norka mentioned having used pork shoulder previously, but it sounds like the only non-pork belly version mentioned so far was done with pork loin. Has anyone had a pork shoulder version? I can see how pork loin could be too dry. But pork shoulder seems like a nice middle of the road solution, not too fatty, but still potentially enough fatty bits to go round. I have had two variants of this pork sandwich: all fat belly and a half pork belly/half pork shoulder. I will admit to also trimming the fat from the pork belly and returning it to the sandwich as Mike did. The half and half one was quite acceptable because it balanced the two extremes of lean and fatty.